EFFICENCY OF PHOTOACTIVATED DISINFECTION ON EXPERIMENTAL BIOFILM - SCANING ELECTRON MICROSCOPY RESULTS. Department of Operative Dentistry and Endodontics, Faculty of Dental Medicine, Medical University, Plovdiv, Bulgaria. Photoactivated disinfection is a new antimicrobial method for root canal disinfection, based on photodynamic therapy. Purpose: The goal of this study is to investigate the antimicrobial effect of photoactivated disinfection on experimental biofilm from Enterococcus faecalis and Candida albicans, through scanning electron microscopy. Material and Methods: Freshly extracted, one root teeth were prepared with a sequence of rotary nickel-titanium files (ProTaper ; Dentsply ; Mailefer ), irrigated, the external root canal surfaces isolated with nail polish and autoclaved. After the incubation with the experimental biofilm, the root canals were filled with photosensitizer - Toluidine Blue – 0,01% and irradiated with Foto San(CMS Dental), 630 nm, 2000mW/cm2 for 30 seconds. SEM was performed on the coronal, middle and apical third of the root canal, for evaluation of the results. Results and discussion: In the range of 600 to 8000, SEM showed significant reduction of microorganisms from the canal system. A large increase in microorganisms was observed, showing a disturbance in the cell membrane, as effect from the activation of chromophore with the laser and the penetration of the photosensitizer in dental tubules. In the apical third single microorganisms were observed. This may due to decreased penetration of the photosensitizer, incomplete pervasion of MB in the biofilm or insufficient oxygenation. Conclusion: FAD has the potential to be a good alternative and addition to the conventional root canal disinfection methods. SEM is a precise method for endodontic treatment result evaluation. Filipov I, Markova K, Boyadzhieva E. Efficiency of photoactivated disinfection on experimental biofilm – scanning electron microscopy results. J of IMAB. 2013; 19(4):383-387. doi: 10.5272/jimab.2013194.383. 2. Vangelov L, Stamatova I, Vladimirov St. Rentgenographic evaluation of periapical status and its relation with the quality of endodontic treatment. Dental medicine. 2008; 90(1):17-23. ? [in Bulgarian] ? 5. Lalabonova Hr, D. Kirova, D. Atanasov. Microbiological studies at acute odontogenic infection. 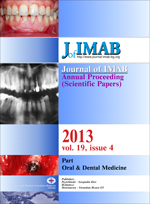 Annual proceedings (scientific papers) IMAB. 2002; 8(1):88-90. [in Bulgarian] . 6. Kirova D, Chr. Lalabonova, D. Atanasov. Bacterial microflora and antibiotics in infectious diseases in the oral and maxilla-facial region. J of IMAB. 2004; 10(2):72-73. [in Bulgarian]. 16. Raab O Über die Wirkung Fluoreszierender Stoffe auf Infusorien. Z Biol. 1900; 39:524–46. 30. Ogura MAA, Blissett R, Ruggiero K, Som S, Goodson J, Kent R, et al. Photomechanical wave-assisted molecular delivery in oral biofilms. World J Microbiol Biotechnol. 2007; 23:1637–46. 40. Taoufik K, Mavrogonatou E, Eliades T, Papagiannoulis L, Eliades G, Kletsas D. Effect of blue light on the proliferation of human gingival fibroblasts. Dent Mater. 2008 Jul;24(7):895-900. [PubMed] [CrossRef].